Aeon Preservation is excited to have begun work on the Volcano House, located in the Hawai’i Volcanoes National Park. 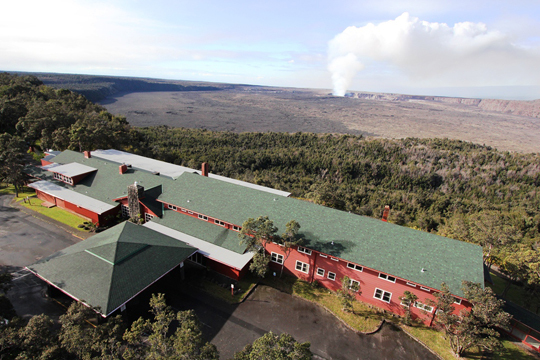 This historic hotel is perched on the rim of Kilauea volcano and is the site of a series of lodgings going back as far as 1846 when there was a simple grass hut there. Currently closed, the National Park Service aims to sympathetically restore this wood and stone structure and to improve its fire and seismic safety fittings. Aeon is currently making suggestions for the preservation and maintenance of the building. The unique surroundings of this notable hotel mean that its preservation requirements are also out of the ordinary. In addition to the usual wear and tear caused by visitors and other factors, Lane and Alfonso are taking into account the high levels of sulphur dioxide in the air. This is produced by volcanic eruptions and can have a corrosive effect on stone and other materials. High levels may even cause Volcanoes Park to be evacuated! The beautiful but unconventional location and the challenges that this brings have provided Aeon with an interesting project. Check back for more information as this assignment proceeds!